New Manager Launches! Here's what you should know. I'm not able to create an event in the previous Convene Manager 1.0. Since new Manager 2.0 is available, we've disabled the ability to create new events in the "Legacy" (old) platform. All upcoming events should be created in the new Manager 2.0 here. We promise, you're going to love it! Please review this short getting started article. I have an upcoming event, will there be any service interruption? No. There will be no service interruption and Convene use will be seamless to the user. Should I move my event to the new Manager 2.0? Maybe. Contact support and let's discuss. The litmus test is simple, if attendees have been added to an event, then no. Don't migrate. If not, it's possible. I see 2 Convene apps in the app store. Why? Which one should I use? 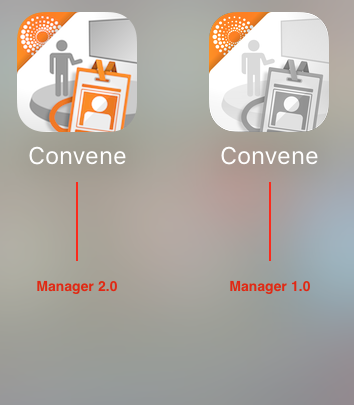 We've renamed the old version of Convene to "Convene - Gen 1" and changed its icon to be more gray-scale. As long as your event is active or upcoming, this version of Convene will remain in the app stores. The moment that Convene legacy has no more upcoming events, we'll pull the "Convene - Gen 1" apps from all app stores.